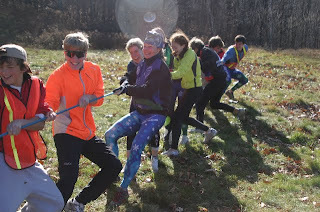 Sunday was a training mode triple: roller ski, hill run and tug-o-war. Bonuses to the day: alums Rosalie and Beth joined us, AND the BKL skiers were going to be at the Skiway! A carefully choreographed plan had skiers of all ages simultaneously finishing at the top of Holts Ledge. The morning was clear and frosty as the team gathered at the intersection of route 10 and River Road in Orford. 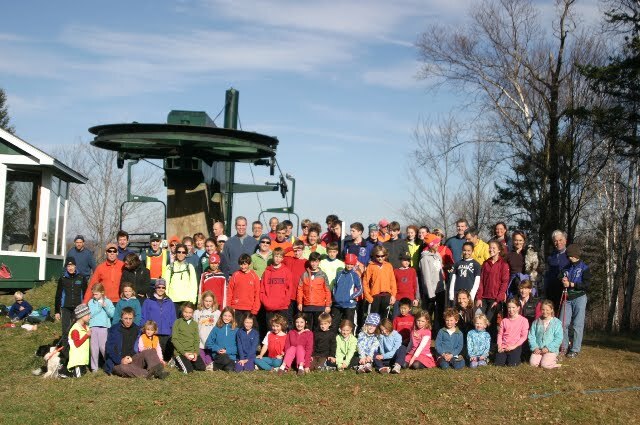 The plan: roller ski to the Skiway, run around the neighborhood and up to Holts Ledge via the AT, and a tug-o-war with the BKL skiers. Roller skiing was classic and the route covered long stretches of new pavement. Open fields, bright sun, fresh pavement.. all good. Total distance to the Skiway – 9 miles. A change to shoes and a quick snack, meeting up with Paddy and Tim, and off to the top of Holts Ledge. Timing couldn’t have been better, the grades 5 through 8 BKL skiers were just gathering for a picture when the JNT came up the trail. Picture taken and a short walk to the top of the chairlift and this group met the younger BKL skiers who had walked up the face of the mountain. 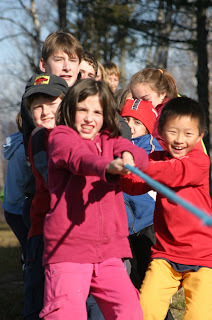 Sunshine, more snacking and then a tug-o-war, BKL vs JNT. BKL won. Pay attention the weather this week, it might affect practice!